In 1960, Verner Panton, a young and talented Danish architect and interior designer working at Arne Jacobsen’s practice, visited a factory making safety helmets and buckets. The conveyor belts moved the newly molded plastic products towards an end of line area where they would all end up neatly stacked atop each other. Two ideas stuck to Panton’s head: mass-producing unassembled, one-piece furniture and an easy way to save space thanks to stacking them up together. With newly ignited obsession in his head, Panton began a task that took him a good seven years of frustration, re-designs and the learning of a new material: polypropylene, a thermoplastic polymer new at the time and used today in a vast variety of products, from ropes to thermal underwear, automotive parts and reusable containers. With Panton, polypropylene would become the integral heart and soul of one of the most iconic chairs of the twentieth century, one that still survives in the current millennium: the S chair. Being mass-produced dictated that Panton looked for a material that could allow for minimal assembled parts, in his case, no assembly at all. Driven by this functionality objective, the chair soon lost many of its essential components, mainly the legs, and then the back, and it became a kind of svelte S-shaped slide. Panton found quite a lot of opposition from local Danish manufacturers, who simply refused to produce to his designs for considering them unattainable. Undeterred, Panton managed to convince a Swiss company, Vitra, to help him develop his vision and in 1963 Panton and Vitra commenced one of the most beautiful journeys in design and manufacturing: the creation of an impossible and challenging dream that took both parties to challenge the status quo of the time and to experiment with colours as well as shapes and materials. 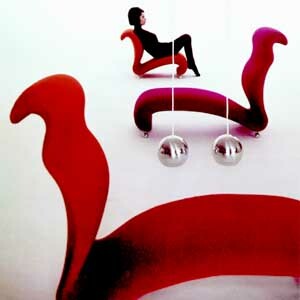 The Panton S chair was introduced to the public in 1967 and was considered a ‘sensation’, receiving numerous awards. Still today, it is not uncommon to find it in most hip restaurants, funky offices and young professionals’ homes because its undeniable futuristic flare and organic shape are the values that today continue to resonate with many discerning buyers. Was Panton an artist or an innovator? To my mind, Panton’s work in industrial design, creating products for their use in our lives makes his creations thrive towards delivering functionality above artistic values. Why his work is genius is because he achieves to deliver exceeding values for both disciplines: his original chairs exhibit at modern art museums worldwide as well as continue to perform as chairs for people to sit on. Art has no purpose but to challenge predecessors, to shuffle emotions, to inspire. Art is to be looked at. Innovation comes into play when a designer brings the difficulty of the abstract values of Art into the creation of a product meant to deliver an execution, a purpose, and a service to a human. Innovation, in Panton’s case, was to transform functionality with artistic and scientific values.